Lucky marsupial. I could use a nap too. Check out the guest strip I’m doing for Dave Kellett’s funny awesome strip, “Drive!” I did an eleven page story, and one will post every Tuesday, so make sure you keep up on it! (and read the archives too. Worth it). HWHAAHT?! You make fun of how Bikkie TALK?! Hey Bikkie! Zappers don’t HAVE bowels!! Stupid kanga–HWUUUURCKKK!!! After all of his graphically violent talk, hearing Bikkie is actually capable of being polite and cordial makes the threats all much more intimidating in retrospect. when the giant marsupial is moody, worry. when the giant marsupial is cordial, run. when Joyce is making demands, worry. when Joyce is smiling and offers a handshake, run. when Anesu flicks her uber-gun thingy, worry. when Anesu looks innocent, run. My kingdom* for a “like” button! Mr. Baldwin, you’d best be on your toes. This guy has got your characters down pat. I am continuously amazed how much more capable Nogg’s chosen crew is this time around. And last time he was already outclassed by the Earthians. Looking forward what Christopher has in store for us. For some reason (can’t imagine why…), I seem to be much better at getting into the characters’ cynical sides, whereas he always balances it out through humor, banter, and camaraderie (only some of which are potty-bot related). Next to the more serious treatments of idealism, political action, and (lack of) intelligence. Bikkie kinda reminds me of Stith from Titan Ae. A bit less intelligent but still, the attitude is there no? I cant wait to see where this is all going. “Bikke pushed around enough, now Bikke do pushing! Also stomping, with kicking and tail slapping and to finish off medley with heavy bouncing on one who pushes Bikke around!!! Afterwards like nap and soup. I have Bikke’s voice down as guttural screaming, like, ALL THE TIME…. Me too! I hear him with Randy Blythe’s voice (Lamb of God). Quite a nice speaking voice, but generally savage and scary when singing. 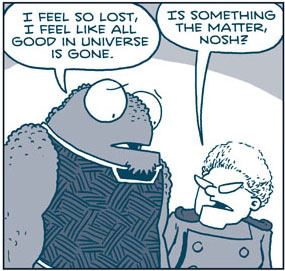 For the record… AGAIN, I love you’ve brought Spacetrawler back and I am already in love with all the new characters. However, I am VERY saddened that Cookrookery has gone dormant. I LOVED those recipes… and still have cooking implements I only bought to make those recipes happen. Your comedic writing fits so well with your drawings the timing is so excellent! Also good to see old friends and new ones. Ever since 2012 this is one of my top stops. 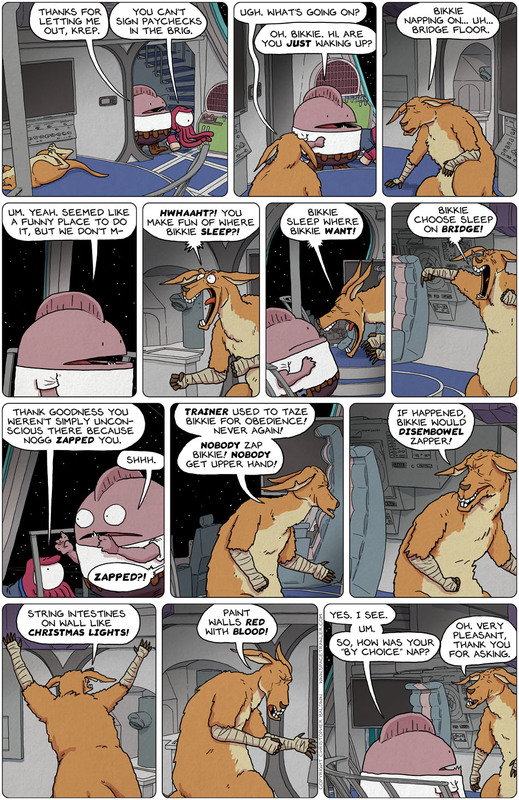 I recommend it to anyone who likes comedy, illustrated stories and SiFi to read.